How does mold get on my roof? Algae grows in standing water, as well as lakes and ponds. The algae spores are carried to our roofs from water sources by the wind, birds, and squirrels. Then from roof to roof where it grows and feeds on the limestone filler in asphalt shingles and the real dirt on the tile roofs may be in some cases, the tiles themselves. 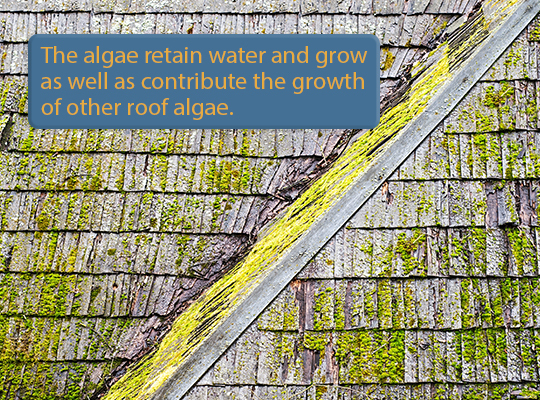 The algae retain water and grow as well as contribute to the growth of other roof algae. What causes mold or algae on my roof? The black stains that you see on your roof is actually a blue-green algae – it’s official name is Gleocapsa Magma. Algae has been around before Man. This type of algae leads to roof stains, roof mold, fungus, lichens, fungi, moss, and mildew. Due to the changes in roofing materials, we are seeing it more often in climates where it is warm and humid. Not only can it be damaging to your home but it can be dangerous to your family and even pets. Let’s learn about what we are dealing with. Algae: Algae are recognizable by their black-green coloring. They like dampness and shade, so they can grow on wood shingles or shakes and asphalt that do not get much sunlight. Roof algae retain moisture, they can cause shingles to deteriorate and eventually rot completely. Algae like the humid conditions in gutters and downspouts and can grow there as well. Moss: Moss likes moisture. It grows on moist wood shingles or shakes. As it grows, it contains, even more, moisture, all resting on the surface of your roof. 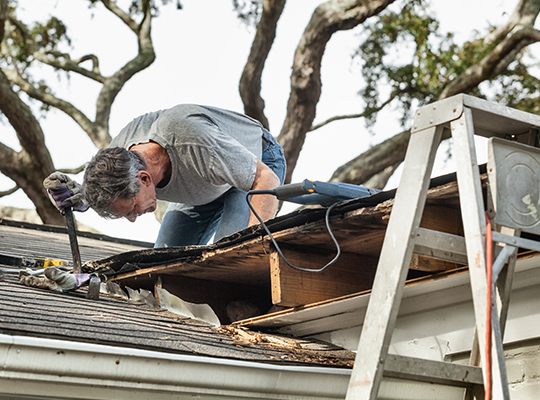 Your roof shingles will start to rot which compromises the integrity of your roof. Mold: Mold appears as a fuzzy or slimy, filmy substance that is usually black or green in color. Mold loves damp or humid environments and spread quickly. Black mold is the most dangerous type of mold. It lives on wood, paper, and drywall. A black mold problem should be addressed quickly because it could weaken the structure of your home or building. Black mold has a strong musty smell and is toxic. It can be the cause of serious respiratory illnesses to people. Mildew: Mildew can be recognized by its powdery consistency. It typically grows in warm, humid and rainy environments. It is usually found on roofs with poor drainage or where trees hang over the roof line. Mildew spreads fast and is green, black, red or pink in color. Got mold on your roof? Contact HomeMD for mold testing and inspections! Read next: How do I get mold, algae and other harmful organisms off of my roof?